Travel safe anywhere in the city! Using OpenNYC data sets, we parse crime statistics to find which areas in the city are safer than others. Then we get straightforward directions from your location to your destination using the safest routes possible for walking. Python backend to parse data sets and create a grid of safe and unsafe spots. Each tile in the grid has a score corresponding to how safe it is. We find the shortest path between two tiles with the minimum weight (safest path). 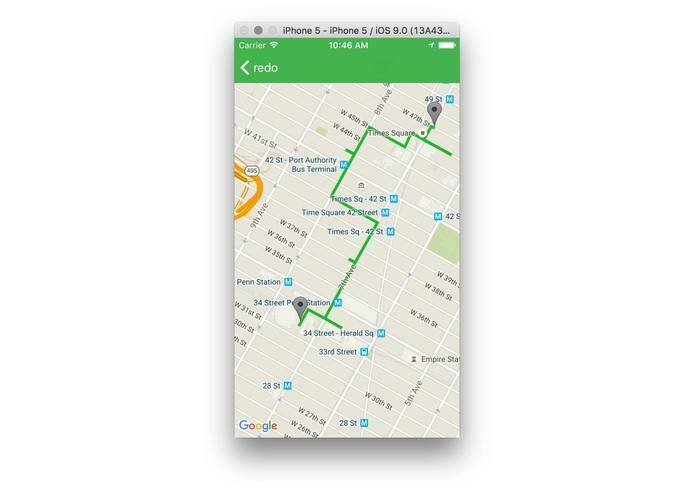 We have an IOS app written in Swift to get user input and show directions to the destination using Google Maps sdk to embed a map. Determining how particular crimes affect the weight of a certain area in the grid. Determining the size of the tiles in the grid: needs to be small enough to provide 'safe' routes, but large enough to have enough data per tile. Creating a routing algorithm that finds the shortest path as well as a path that avoids dangerous areas. Parsing data sets with different standards to aggregate data and develop a proper heuristic to mark safe and unsafe spots. Also, coming up with a shortest path minimum weight algorithm for our grid. Aggregating 'difficult' data sets, developing more efficient algorithms to handle data and reduce computation time. I analysed the NYC open datasets used for the scoring algorithm and worked on the backend part for mapping NYC Street data to a lat-long grid. I worked on the backend algorithm to compute the safest path by augmenting the google shortest path with strategically placed waypoints.